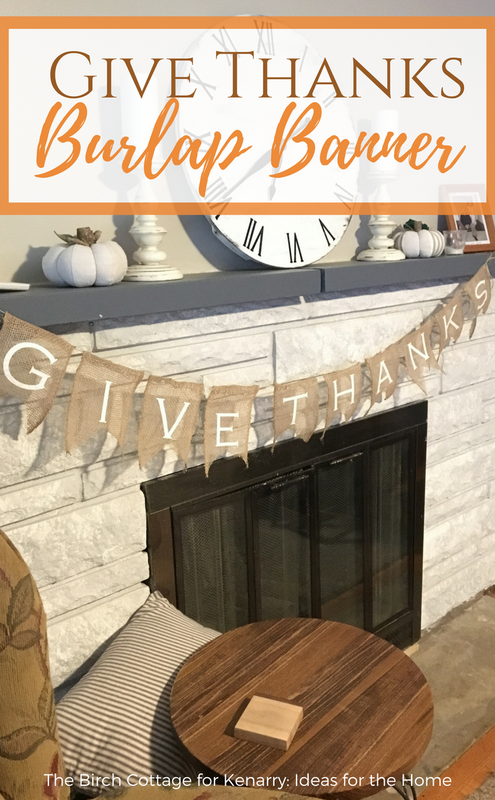 Learn how to make this no sew Give Thanks Burlap Banner using burlap ribbon! Hello, October! I’ve been waiting for you! I seem to feel that way about the arrival of October every year. The air’s a little cooler, the humidity is down (thank goodness) and we can even manage to open up the windows on our house and let in some fresh air. Today, I’m over on Kenarry: Ideas for the Home sharing this easy DIY Give Thanks Burlap Banner project tutorial. I gotta say the burlap ribbon from Kenarry makes this project so much easier. And although I call this my “no sew” Give Thanks Burlap Banner, you can definitely make this using your sewing machine. The sewing machine makes it surprisingly easier! Just hop on over to Kenarry to find the full tutorial. And you can see my Fall Burlap Wreath here on The Birch Cottage blog. I followed this tutorial from Kenarry. I do hope you’ll join me over on Kenarry: Ideas for the Home. Kenarry has a new team of contributors this year and I’m sure there will be all kinds of exciting ideas for the home!